I love liver, this calves liver recipe is an ‘ensemble recipe’ all wrapped around very simply pan fried calves liver cooked nice and pink. Calves Liver With Balsamic Roasted Shallots & Jerusalem Artichokes. 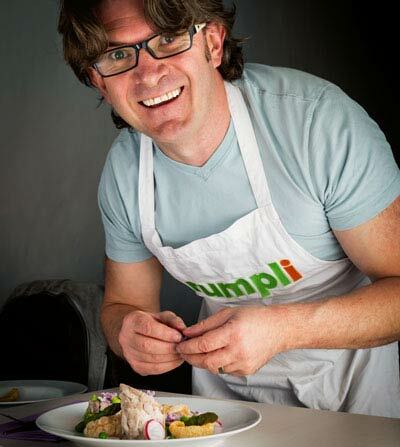 I love cooking and eating with offal. This calves liver recipe is the latest foray into the often maligned world of cooking with ‘variety meats’. Calves liver is often seen as the Rolls Royce of the offal world by many. It is not difficult to see why it has a beautiful flavour and is really very approachable. This particular recipe is a play on the idea of liver and onions with bacon. This one, however, is a little deconstructed and a whole lot lighter. 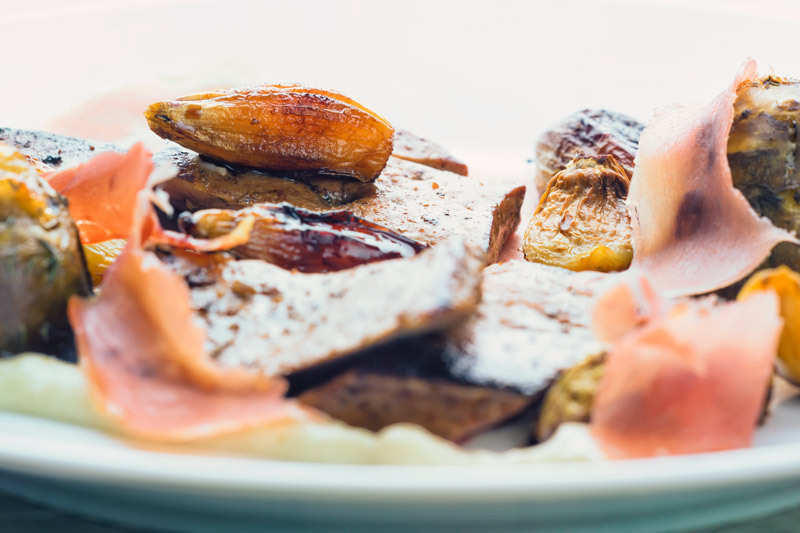 It features Serrano ham instead of bacon and both roasted garlic and roasted balsamic shallots! Just for good measure we also have both a Jerusalem artichoke puree and roasted Jerusalem artichokes. 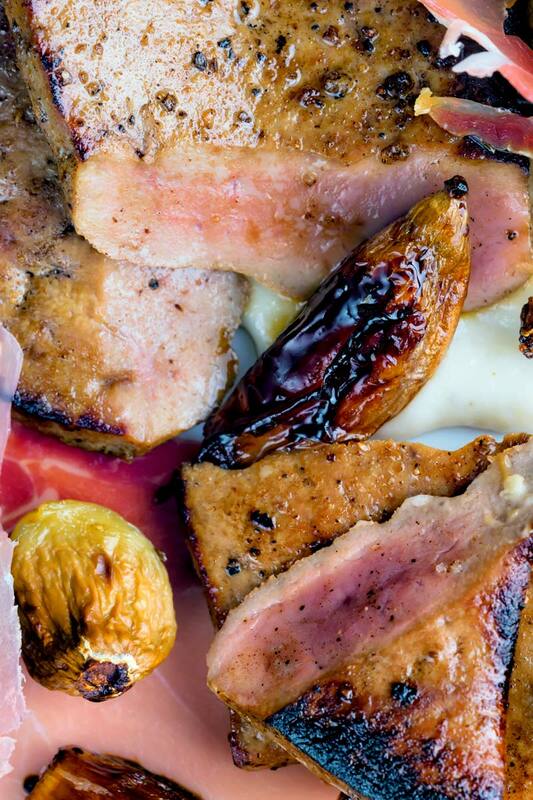 How to Fry Calves Liver. As far as I am concerned the best way to cook this liver is to fry it quickly in butter. To be honest, anything fried quickly in butter is magic. But this is delicate liver really benefits from staying nice an pink inside. Ordinarily, calves liver will be sold in slices around 1cm thick, this perfect. The process of frying it is simple, dip in a little flour seasoned with salt and pepper. Then shake off any excess flour, before melting a generous amount of butter in a pan over a high heat. Then add in the liver when the butter foams ensuring that you do not crowd the pan. Cook for no longer than 90 seconds a side and rest for a minute or two. Sometimes simple is the very best option when it comes to cooking. How to Roast Jerusalem Artichokes. The pan-fried calves liver at the center of this recipe really does deserve fantastic side dishes. I have written at length about Jerusalem artichoke or sunchoke puree when I used it in my pork chop with Jerusalem artichoke puree recipe. 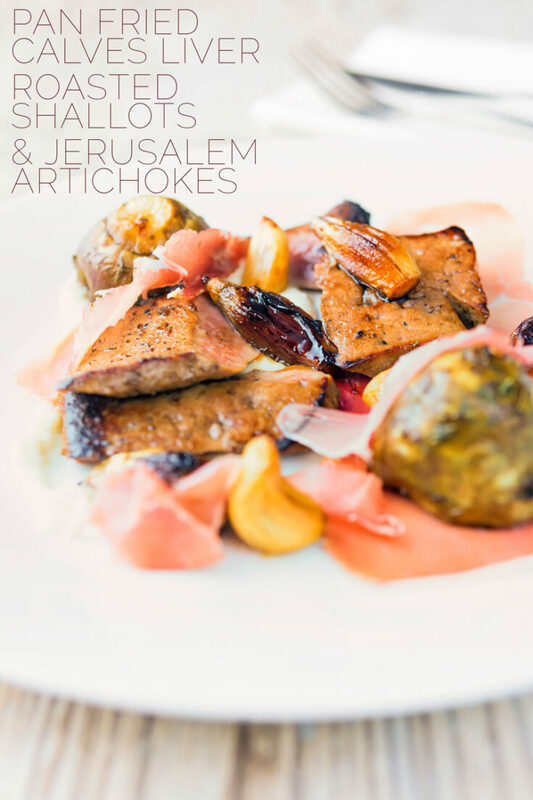 I have yet to write about roasted Jerusalem artichokes though… They are very special indeed, they have a wonderful sweet nutty flavour. Most importantly they are really easy to cook and need very little prep. All you need to do is give them a scrub, cut them so that they are even in size. Finally, they just need seasoning and oiling before roasting until cooked. This takes around 45 minutes or so depending on the size. The inside flesh goes cream whilst the outside varies from crispy to chewy. If you have not tried it then you really are missing out, they are so very good! I am very fond of cooking with liver. For many cooks, the closest they get to liver is in a pate. It has a big and bold iron-rich flavour and the most exquisite texture. Forget the boot leather you were bought up with. Liver can be as tender as fillet steak and it always has much more flavour! Notwithstanding my very old school and tradtional liver and onion recipe I mentioned earlier I also use them in my faggots and mash recipe. But they are far more versatile than many give them credit for. My relatively new chicken liver ragu recipe shows them in an entirely new light. Everyone needs to ditch their preconceived ideas of offal and this pan fried calves liver recipe is the perfect place to start! 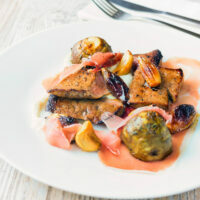 I love liver, this calves liver recipe is an 'ensemble recipe' all wrapped around very simply pan fried calves liver cooked nice and pink. Cut 300g of the Jerusalem artichokes into 50g chunks and pour over half of the cooking oil and thyme and toss around to cover. Season generously with salt and pepper and then roast at 180°C or 350°F for 45 minutes. Peel the remaining Jerusalem artichoke, then slice and boil until soft in salted water. This will take around 15-20 minutes depending on size. Heat a frying pan over a medium high heat and when hot add the remaining cooking oil. Throw in the shallots and brown sugar and cook for 4-5 minutes. Then pour in the balsamic vinegar and stir to combine. Add in the garlic cloves and transfer to a small roasting tin an place in the oven at 180°C or 350°F for 25-30 minutes. When the artichokes that you are boiling are soft transfer them to a blender, add the cream and then blend to form a smooth puree. Test this puree for seasoning and add appropriately and set aside to be reheated just before serving. 5-6 minutes before the shallots and Jerusalem artichokes come out of the oven reheat the pan that the shallots initially cooked in over a high heat. Season the calves liver which should be pretty thinly sliced (1cm or so) with salt and pepper. Add the butter to the pan when hot and when it foams add the liver. Fry for a minute to 90 seconds on each side and allow to rest for a minute. Carve and plate up as you like! I just love liver so much, but have never had calfs liver before. I def want to try it. 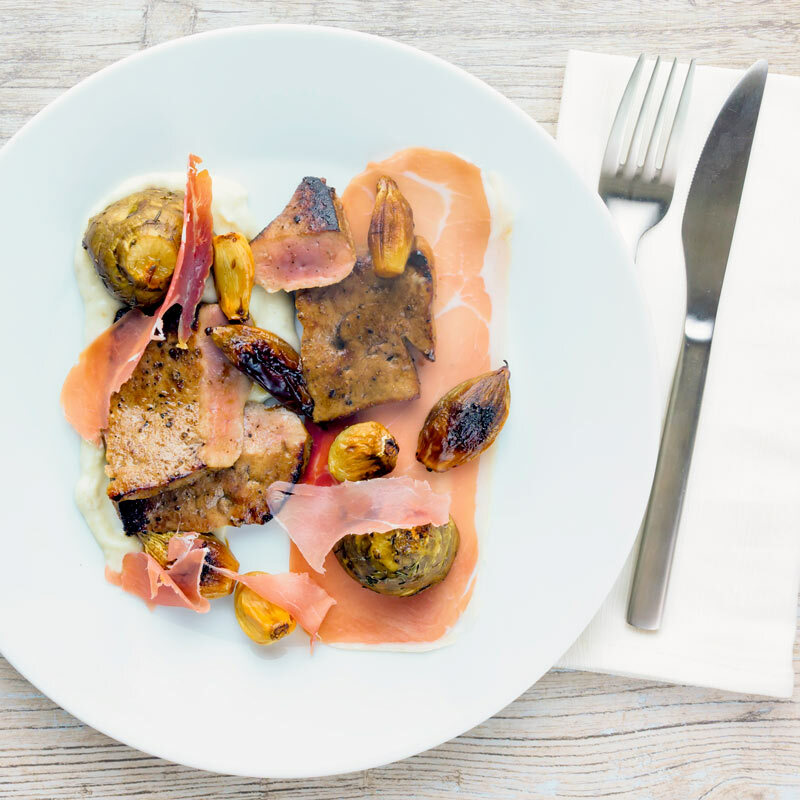 Loving the flavors you used here -the balsamic and artichokes are such a great idea! This looks delicious! It’s a shame that liver is not used more often and that so many people refuse to eat it – including my husband unfortunately! I would love to try this. Hehe, it is basically liver bacon and onions twisted around a little. My husband loves liver, so he would enjoy this for sure. I have never seen it with balsamic before. Liver and balsamic is a really old pretty classic combination, the iron-rich liver with the almost sweet and sour liver is delicious!